It’s Halloween, and if you’re anything like me, October 31st is the date I look forward to every year: not for the candy, the dress ups, or the parties, but for the public holiday on the day after that allows Melburnians to follow the most prestigious annual horse racing event. Yes, a public holiday for a horse race. But, that’s a story for another post. 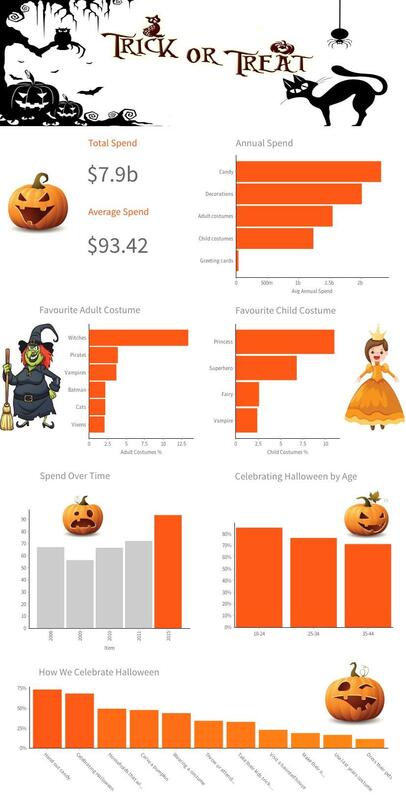 To celebrate this event (Halloween, not the horse racing), I thought I’d try some of the new data visualization features available in Yellowfin 7.3 – the soon-to-be-released update to Yellowfin’s Business Intelligence platform – to create a quick infographic and analyze the ever-growing spend for Halloween. So if you’re a Halloween fanatic – or perhaps a company that produces witches outfits, princess costumes, or candy – you’re in for a treat! Check out the video below for a behind-the-scenes look at how this infographic was built in Yellowfin 7.3.